This season, two of our most ‘hippest’ brands get set for a chic collaboration designed to give you the ultimate fashion uplift. Diet Coke and ASOS are creating a style stampede as they launch a fashion giveaway and search for the nation’s Street Style Star. Diet Coke is giving you the chance to update your wardrobe for less with the latest collections from ASOS*. 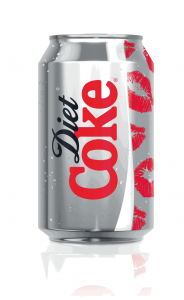 Look out for the limited-edition lip-smacking Diet Coke can, available in stores nationwide from March. 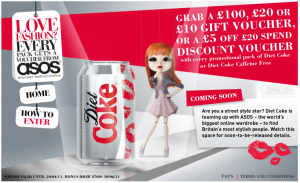 Simply enter your unique on-pack code on Coke Zone to get your hands on vouchers worth £100, £20 and £10 to spend at the online store or £5 off your next ASOS purchase of £20 or more. Taking its inspiration from the bold red lips on this season’s catwalks, the iconic silver can has been kissed with a print of the perfect rouge pout. So go on, pucker up and collect your own piece of Diet Coke fashion history. I adore this stylish can so much!With this fashionable offer, there’s no excuse not to splash out on ASOS this Spring/Summer ’11. From bold colours and minimalism, to botanical prints and collegiate style, every Diet Coke girl is sure to look sizzling this season. And calling out to all Street Style Stars! If you think you have a style worth shouting about, Diet Coke and ASOS want to know. Together they have launched Street Style Star to uncover the most inspiring looks from around the country, with three lucky winners getting to see themselves and their signature style up in lights on the world-famous Piccadilly Sign in London. Just abit amazing – right? How to enter: Anyone can enter, so showcase your striking style by uploading a photo to asos.com/streetstylestar from 28th February until 4th April.